The terror bird Andalgalornis brings its powerful beak down in a hatchet-like jab to attack its prey, a peculiar cat-sized herbivorous mammal called Hemihegetotherium. Andalgalornis was an extinct, 4.5-feet-tall, flightless predatory bird found as 6-million-year-old fossils in northwestern Argentina. Credit: Illustration by Marcos Cenizo, courtesy of the Museo de La Plata. The ancient "terror bird" Andalgalornis couldn't fly, but it used its unusually large, rigid skull -- coupled with a hawk-like hooked beak -- for a fighting strategy reminiscent of boxer Muhammad Ali. The agile creature repeatedly attacked and retreated, landing well-targeted, hatchet-like jabs to take down its prey, according to a new study published this week in the online, open-access journal PLoS ONE by an international team of scientists. The study is the first detailed look at the predatory style of a member of an extinct group of large, flightless birds known scientifically as phorusrhacids but popularly labeled "terror birds" because of their fearsome skull and often imposing size. Terror birds evolved about 60 million years ago in isolation in South America, an island continent until the last few million years, radiating into about 18 known species ranging in size up to the 7-foot-tall (2.1 meters) Kelenken. Because terror birds have no close analogs among modern-day birds, their life habits have been shrouded in mystery. Now, a multinational team of scientists has performed the most sophisticated study to date of the form, function and predatory behavior of a terror bird, using CT scanning and advanced engineering methods. 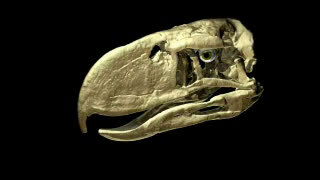 This is a QuickTime movie of an animation of the skull of the terror bird Andalgalornis showing CT-scan slices going through the skull (revealing the source data for much of the research), as well as a series of powerful downward bites followed by pulling back of the skull by the neck. Andalgalornis was an extinct, 4.5-feet-tall, flightless predatory bird found as 6-million-year-old fossils in northwestern Argentina. Movie by Ridgely & Witmer, Courtesy of WitmerLab at Ohio University. "No one has ever attempted such a comprehensive biomechanical analysis of a terror bird," said study lead author Federico Degrange of the Museo de La Plata/CONICET in Argentina, who is conducting his doctoral research on the evolution of terror birds. "We need to figure out the ecological role that these amazing birds played if we really want to understand how the unusual ecosystems of South America evolved over the past 60 million years." The terror bird under study is called Andalgalornis and lived in northwestern Argentina about six million years ago. It was a mid-sized terror bird, standing about 4.5 feet tall (1.4 meters) and weighing in at a fleet-footed 90 pounds (40 kg). Like all terror birds, its skull was relatively enormous (14.5 inches or 37 centimeters) with a deep narrow bill armed with a powerful, hawk-like hook. Article co-author Lawrence Witmer of the Ohio University College of Osteopathic Medicine ran a complete skull of Andalgalornis through a CT scanner, giving the team a glimpse into the inner architecture of the skull. The scans revealed to Witmer, Degrange and article co-author Claudia Tambussi, also from the Museo de La Plata/CONICET and Degrange's Ph.D. advisor, that Andalgalornis was unlike other birds because it had evolved a highly rigid skull. "Birds generally have skulls with lots of mobility between the bones, which allows them to have light but strong skulls. But we found that Andalgalornis had turned these mobile joints into rigid beams. 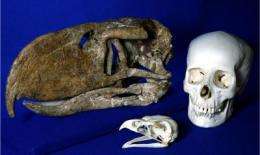 This guy had a strong skull, particularly in the fore-aft direction, despite having a curiously hollow beak," said Witmer, Chang Ying-Chien Professor of Paleontology and a professor of anatomy. The evolution of this large and rigid bony weapon was presumably linked to the loss of flight in terror birds, as well as to their sometimes gigantic sizes. From the CT scans, Stephen Wroe, director of the Computational Biomechanics Research Group at the University of New South Wales, Australia, assembled sophisticated 3D engineering models of the terror bird and two living species for comparison (an eagle, as well as the terror bird's closest living relative, the seriema). Using computers and software supplied by Wroe, Degrange and Karen Moreno of the Université Paul Sabatier in Toulouse, France, applied an approach known as Finite Element Analysis to these models to simulate and compare the biomechanics of biting straight down (as in a killing bite), pulling back with its neck (as in dismembering prey) and shaking the skull from side to side (as in thrashing smaller animals or when dealing with larger struggling prey). Color images created by the program show cool-blue areas where stresses are low and white-hot areas where stresses get dangerously high. This is a fossil skull of the terror bird Andalgalornis, compared with the skull of a modern-day golden eagle and a human skull for scale. Andalgalornis was an extinct, 4.5-feet-tall, flightless predatory bird found as 6-million-year-old fossils in northwestern Argentina. Credit: Courtesy of Ohio University. The engineering simulations supported the CT-based anatomical results. "Relative to the other birds considered in the study, the terror bird was well-adapted to drive the beak in and pull back with that wickedly recurved tip of the beak," remarked Wroe, "but when shaking its head from side to side, its skull lights up like a Christmas tree. It really does not handle that kind of stress well at all." A key part of the engineering analysis was determining how hard of a bite Andalgalornis could deliver. To examine bite force in birds in general, Degrange and Tambussi worked with zookeepers at the La Plata Zoo to get a seriema and an eagle to chomp down on their bite meter. "Combining all this information, we discovered that the bite force of Andalgalornis was a little lower than we expected and weaker than the bite of many carnivorous mammals of about the same size. 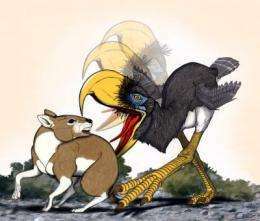 Andalgalornis may have compensated for this weaker bite by using its powerful neck muscles to drive its strong skull into prey like an axe," Degrange said. Taken together, the team's results give new insight into the lifestyle of a unique avian predator. This terror bird was no slugger and couldn't wade into the fray like a feathered Joe Frazier. Its skull, though strong vertically, was too weak from side to side, and the hollow beak was in danger of catastrophic fracture if Andalgalornis grappled too vigorously with large struggling prey. Instead, the study shows that the terror bird was required to engage in an elegant style more like Muhammad Ali, using a repeated attack-and-retreat strategy, using well-targeted, hatchet-like jabs. Once killed, the prey would have been ripped into bite-sized morsels by the powerful neck pulling the head straight back or, if possible, swallowed whole. Feeding on a diversity of strange, now-extinct mammals and competing with the likes of saber-tooth marsupials, terror birds became top predators in their environment. At least one gigantic terror bird, Titanis, eventually invaded North America about two to three million years ago, but the animals disappeared from Earth shortly after. do they have any stomach contents or marks on other fossils to show what this guy really ate?maybe it used those big feet to move thru mudflats and the beak to dig for very large worms.